The ACLU of Massachusetts believes that body-worn cameras—along with police-civilian receipts, better training, and better data—can be an important step towards greater oversight and accountability of police officers. We urge cities and towns across Massachusetts to adopt body-worn camera programs that follow three core principles: accountability, privacy, and transparency. Body cameras are not a panacea. But, if combined with good policies, they can build community trust and improve safety on both sides of the badge. That's why it's not enough for Massachusetts cities and towns to join their peers in other parts of the country that have implemented body cameras—we also need to do it right. To that end, the ACLU has offered our model policy, backed by civil rights groups and community groups. In fact, on June 28, 2016, we sent our suggested model policy to 40 police departments across the state. We selected communities where body-worn cameras might offer a benefit given the concentrations of three potentially vulnerable populations: people of color, non-English speakers, or people living below the poverty threshold. Currently, 66 of the 100 biggest police departments in the U.S. have either implemented or are planning to implement police body-worn cameras. 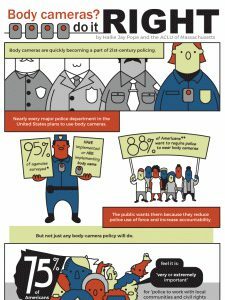 The ACLU's proposed body-worn camera policies include privacy protections for civilians and disciplinary actions for officers who do not follow protocols. The Obama Administration has pledged $75 million to help police departments use body-worn cameras. Learn more by reading our position paper. Who supports police body-worn cameras? The Daily Beast: Who's Against Videotaping Police?